St. Scholastica's a cappella vocal group, Vocal Revolution, will perform its spring concert at 3 p.m. Sunday, April 8, in the Mitchell Auditorium on the Duluth campus. 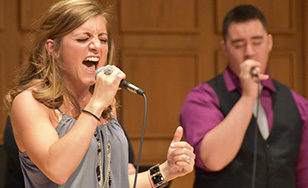 "A Cappella Afternoon" will prove that performers don't need instruments to sound like a rock band. Music lovers are invited to enjoy an afternoon of original a cappella arrangements and covers they won't hear anywhere else. Vocal Revolution will be joined by a cappella groups from Hermantown High School, Denfeld High School, and Shell Lake High School. Tickets are $5 and will be available at the door. For more information, contact the Spotlight box office at 218-723-7000 or spotlight@css.edu.